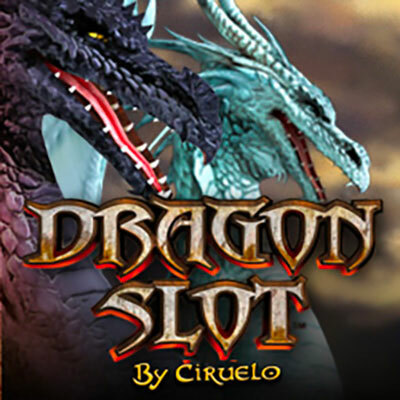 Dragononline slots casino game features fire-breathing dragons. The reels, framed intricately by metal knotwork and jewelled weaponry, are see-through and overlay a castle silhouetted against a fiery orange sky. The beautiful artwork for this game is done by fantasy Argentine artist, Gustavo Cabral known as Ciruelo. The soundtrack is soft but ominous and lurches into strident razzmatazz for wins. Founded in 2008, Leander Games are based in Buenos Aries in Argentina. They specialise in games for the Latin American gambling market and their development is highly innovative. They consult musicians and graphic artists as well as game developers and mathematicians when creating their game content. Dragon slots hasa5 reel, 3row, 20payline format. At the bottom end of the paytable are the usual playing cards, then there are the blue, red and green dragon at the middle of the paytable, with the white dragon next and the black dragon at the top end of the paytable. Click Info to view the rules and the paytable. Select your paylines (from 1 to 20), select your line bet (from 0.01 to 5.00). You can play auto choosing a number of spins under Autoplay, using the up and down arrows. Then click Start. You can stop the autoplay by clicking Stop at any time. YELLOW DRAGON – substitutes for all symbols apart from scatters and bonus symbols. BATTLE HELMET – three of these offer a payout x5 your bet, four offer x25 and five x100. DRAGONS FIGHT – three of these on reels 2, 3 and 4 trigger the dragons fight bonus game. KNIGHT –three of these on reels 1, 3 and 5 trigger the free spins bonus game. Triggered by three bonus symbols, you’ll join the fight between the white and red dragons, poised on rocks split apart. Click Start and wait to see which one breathes fire on the other.After each breath, there’s a reckoning and the life indicator of each dragon updated. The fight continues until one of the dragons is dead. Triggered by three bonus symbols, you’ll enter the free spins bonus game. Pick the red, blue or green dragon for a different number of picks to reveal more free spins and multipliers. But if you pick the warrior then you will enter the free spins round with just the standard ten free spins and a x1 multpilier.While spinning, reel one is wild, upping your chances of winning combos.